The president reveals his choices as March Madness envelops White House. From the economy to the wars, President Obama may not have made any slam dunks on political issues yet, but the avid sports fan called a timeout from these issues to talk a little basketball. In an interview with ESPN's Andy Katz in the White House Map Room, the president revealed his NCAA choices -- he picked North Carolina, Louisville, Memphis and Pittsburgh in his Final Four bracket. And who is the president betting on to take it all? The University of North Carolina. "Here's what I like about Carolina: experience and balance," Obama said. "I'm going with experience, and I think that Ty Lawson is going to be healthy. I think having an experienced point guard who can control the game and make free throws at the end, that's going to be the difference." Before he became commander in chief, Obama played with the Tar Heels during a campaign stop in Chapel Hill. As he wrote his final pick to the imaginary sound of a drumroll, Obama warned UNC: "Now for the Tar Heels who are watching, I picked you all last year -- you let me down. This year, don't embarrass me in front of the nation, all right? I'm counting on you. I still got those sneakers you guys gave me." 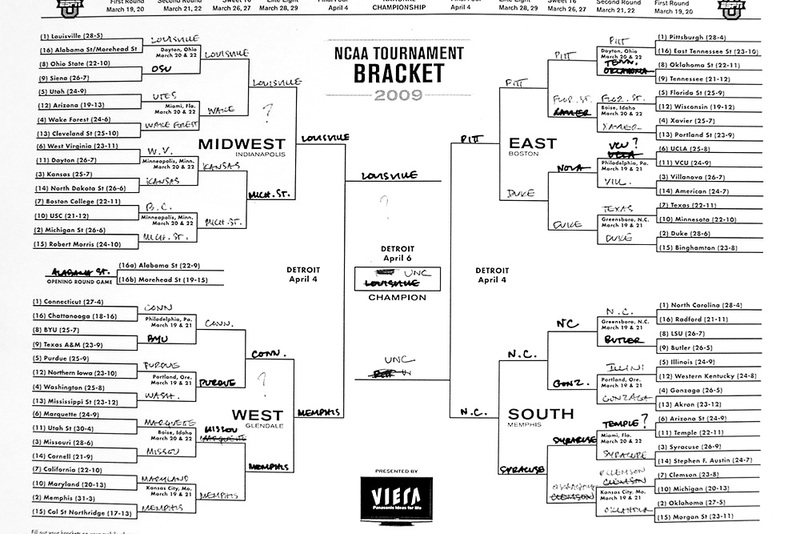 The bracket shows that the president initially picked Louiseville to win the finals, but then scratched it to finally pick UNC, which he also predicted -- wrongly -- last year, to win over University of California, Los Angeles. Kansas, which was in his Final Four and where his mom was born, advanced as the champions. View President Obama's full bracket here. He may not be able to watch games until 2 a.m. anymore, but the president was as knowledgeable about basketball as those who are part of the game, Katz writes about the interview. From Ty Lawson to DeJuan Blair, he knows his game. On picking Memphis, the only one in his final four with a No. 2 seed, Obama told Katz: "I think Memphis has got a very athletic team," Obama said. "I think they've got a good shot." And what about Arizona, home state of his former rival Republican Sen. John McCain? "It has nothing to do with McCain. I think Arizona's a great state. I love playing golf there, but they just squeaked in." Katz, a senior college basketball writer for ESPN and ESPN.com, told "Good Morning America's" anchors that he was "amazed" at the president's knowledge of basketball. "He knew about Ty Lawson ... the point guard for North Carolina. He knew Toney Douglas of Florida State has been hot," Katz said. And what was the hardest decision the president had to make when it came to the picks? Choosing Pitt over Duke. Obama's personal aide and right hand man, Reggie Love, hails from Duke, where he played basketball and football. "I still think that Duke, a lot of skilled parameter players, [but] they just don't have the muscle inside. I think [Pitt's DeJuan] Blair is gonna eat them up." Obama, who played basketball in high school, has granted several interviews to the media since he assumed his post in January, but the story of how this one came about is slightly different. In October, Katz interviewed the then-presidential candidate for a story about his brother-in-law, Oregon State basketball coach Craig Robinson. "At the end of the interview, I looked at then-Sen. Obama and said 'look, there's one campaign promise you're going to have to keep. If you win, in March, I'm coming to the White House to fill out the bracket,'" Katz said. "And to their credit, Robert Gibbs, his press secretary, and the president, remembered when I sent in my request and said, 'oh yeah, we're doing this.'" All of the president's picks are No. 1 seeds, except Memphis, which is the only one with a No. 2 seed behind Connecticut in the West regional. The president takes his sports seriously and he's no rookie at basketball. "The memory of Magic, and Bird, and [Greg] Kelser, all those guys ... it was an unbelievable game, and invigorated not only college basketball but ultimately pro basketball as well," Obama told Katz, talking about the inspiration he got from the 1979 championship game between Michigan and Indiana. At the time, Obama was a senior in high school. "So for any kind of basketball fan, Indiana State-Michigan State, that still is one of the greatest games of all time." Two weeks ago, he went to the Verizon Center to watch his hometown team Chicago Bulls play against the Washington Wizards. Possibly inspired by the Bulls' loss, Obama then played basketball for nearly two hours at the Department of the Interior. Basketball is an important part of the president's life, his advisers have said. Gibbs said playing ball helps Obama get exercise and relieve stress. Gibbs says that when Obama plays, he can think about something different, even if only for a short time. The president is known to jump in a pick-up game whenever he can. Even before the Chicago native arrived at the White House, he expressed his desire to convert the tennis courts in the White House to a basketball court. Lately, it's been too cold for the president to play outdoors, but he did admit in his first interview with NBC that he has been playing "horse" on the basketball court. He recently received an autographed shoe from Phoenix's star player Shaquille O'Neal on a trip to Arizona. Basketball may be his first love -- when it comes to sports -- but it's not the only one. He's openly expressed his football picks and hosted a party at the White House during the Super Bowl. He also took in a round of golf while vacationing in Hawaii during Christmas and is set to take in a round with star Tiger Woods at some point. He will also throw the ceremonial first pitch at Nationals Stadium next month. The first round of the tournament begins Thursday. The president may be able to steal a few minutes to watch that game -- the "chances are high," he said -- but during the start of the Final Four, the president and Michelle Obama will be in Europe in their first overseas trip. "We're going to be watching it, but it will probably be 2 in the morning where we are," Obama said. "I'm not going to be able to watch any game the whole way through, but we're going to be checking the scores." And if he's on Air Force One come game time, that's even better. "Air Force One does have DIRECTV," Obama said.